Stacey Knight has a big task on her hands. As Director of Digital at JCDecaux she oversees the digital inventory for the UK’s largest OOH media owner. JCDecaux’s digital network contains 800 screens, rising to 920 by 2014, in key environments such as Rail, Roadside and Malls (excluding JCDecaux operated Airports). This means that all strategic, operational and commercial thinking falls under her remit, but it is the focus on working with creative agencies that is really making the difference. “Up until about 2 years ago, approximately 65% of copy displayed on JCDecaux’s digital screens was ‘borrowed copy’ – static creative taken from a paper poster design, or Press ad”, says Knight. 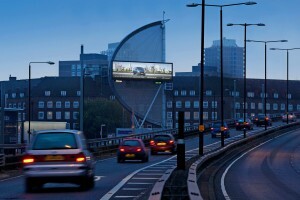 However, since engaging with creative agencies and working collaboratively to bring the best ideas to life, Knight claims that only 5% of creative is now static (in full motion environments, not roadside), with creative agencies now designing animated ads specifically for JCDecaux’s digital screens. The process of educating creative agencies about the capabilities of DOOH makes perfect sense. The digital canvass offers greater creative freedom and can allow advertisers to communicate in new and engaging ways. The creative agencies, it seems, agree and as such are increasingly championing DOOH and pushing its capabilities to their clients. When collaboration between media agency, creative agency and media owner is done correctly, the results can be very impressive and can really show-off DOOH’s true potential for all to see. A campaign for Mini was a great example of this, with Knight citing it as one of her favourite DOOH campaigns that JCDecaux has carried in recent times. 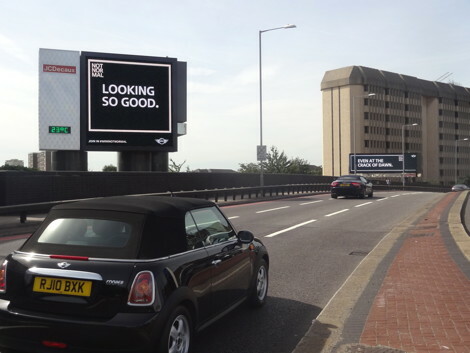 Challenged to produce a ‘not normal’ solution for Mini, JCDecaux used screens on the Cromwell Road to deliver real-time, bespoke messages to passing Mini drivers. Teams of ‘spotters’ were recruited to identify the colour, condition and model of approaching Minis, which enabled a personalised message to be quickly displayed on the screens in time for the drivers to see. Since JCDecaux acquired Concourse Initiatives to set up its own Experiential division, ‘Live’, Knight feels that digital screens (such as Transvision screens in major rail termini) have allowed advertisers to run evermore sophisticated experiential campaigns. The highly praised Lynx Angels campaign is a great example of this, but in January of this year, British Airways used a combination of Transvision and Experiential with equally impressive results. Commuters at Victoria station queued for up to 55 mins to try a flight simulator, with the best performers winning flights to a range of exotic locations. Winners and leaderboards were displayed on the Transvision screens, which fuelled the excitement around the campaign, resulting on over 11,000 people taking part, and countless more sharing their positive experience on social media sites. These types of campaigns are a great showcase for DOOH, but much in the same way as a Fashion Designer will show-off the latest, greatest and wackiest designs on the catwalk, what actually filters down to the high street is often a diluted, yet equally as effective, version. Does a DOOH ad always have to demonstrate the latest innovation, or showcase the latest technologies? “Not at all” says Knight, prioritisng the advertisers objectives and KPI’s over a desire to always use the latest screen technology. “If a client comes to us and wants to do something groundbreaking and innovative, then of course we can do that, but you don’t always need to change the world in order to deliver an effective campaign”. In many cases, DOOH can offer extremely simple, yet effective solutions. The targeting capabilities on offer mean that advertisers can display time sensitive information, or a local relevance that makes the interaction with the audience that bit richer. Critically for Knight, JCDecaux’s DOOH inventory is now performing as a network, rather than a collection of individual screens. JCD’s expansion of its digital estate has resulted in a network of true scale, reaching an audience of 18.8m in a single day. The DOOH industry has long seen itself as a credible alternative to Press, believing that long-term growth of the sector will be driven by advertisers choosing DOOH, rather than Newspapers, to disseminate daily messages. But it is only with a scalable network, Knight believes, that this can become a reality. JCDecaux have also taken steps to make their digital inventory more available to advertisers who want to buy space in a non-standard way. It’s what Knight calls, “going beyond the loop”. The fixed 2 week ‘in-charge’ dates are now gone – a concept belonging to traditional ‘paper & paste’ posters. For years, OOH media owners were accused by media buyers of holding on to 2 week posting cycles for their digital screens and making it difficult to buy space tactically; some believed that it didn’t always suit media owners to sell advertisers a by day, or day-part campaign, particularly if it meant the advertiser spent less. But if true growth of the OOH industry is to be realised, as Knight recognises, then it must be flexible enough to accommodate last-minute requests from Press-spending advertisers. Knight’s team has undertaken extensive audience research to try and understand the mindset of their audience at certain times of day. If the mantra of ‘right message, right time, right place’ is to be achieved, then JCDecaux have a duty to help inform media planning decisions by telling agencies exactly what their audience is feeling throughout the day. The recent research and focus groups has done this and advertisers can now make genuinely informed decisions when contemplating what type of day-part to run. So what does the future of DOOH look like for JCDecaux? Well, the most immediate and exciting development is the new screen being installed at Waterloo station – Waterloo Motion. At the same size as Christ the Redeemer, or 3 double-decker buses – err, standard metrics for measuring length in media, Ed, the early feedback from ad-land is that this will be a show stopper. Despite its huge size, the screen can clearly display copy in size 8 font. Again, creative agencies will need to design specifically for the screen, given that it is not in proportion to any other screen in the market, but the technology behind the screens has been future-proofed as much as possible, meaning that it will be able to accommodate tomorrow’s ideas from creative agencies. As with the BA campaign, Waterloo Motion will also form an integral part of experiential activity at the station, but on a truly epic scale. And it’s not just Waterloo Motion. JCDecaux have also just announced a major project that will see it roadside digital portfolio double in 2014. In London this autumn, JCDecaux will unveil key new premium sites: The Holland Park Tower, the M4 London Gateway and the A40 Spire and will digitise both faces of the iconic M4 Tower. There are also plans to digitise the iconic Old Street Roundabout. JCD’s vision to offer advertisers true scale across its digital inventory seems to be gathering pace, largely due to its sheer size and financial power, but also due to a unique philosophy of just getting stuff done. As Knight confirms, “it’s a JCDecaux mantra: we prefer to do it, rather than just talk about it”. This entry was posted on Friday, October 18th, 2013 at 22:01 @959 and is filed under The Hub. You can follow any responses to this entry through the RSS 2.0 feed. You can leave a response, or trackback from your own site.